We liked yesterday's little Buckyball so much that today we printed pmoews' Large Buckyball from Thingiverse. 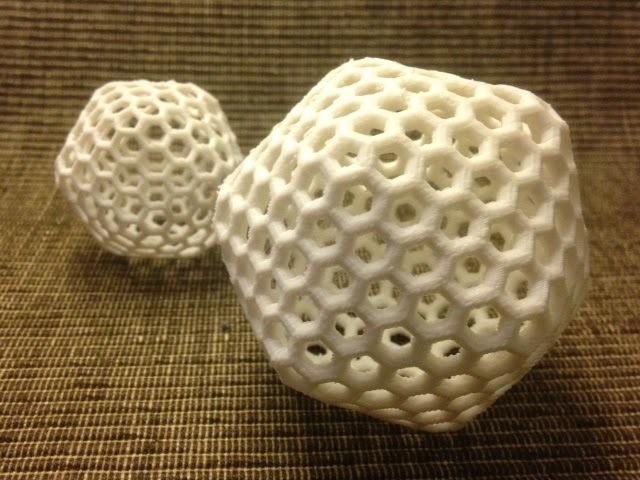 Both models are icosahedral; you can see the icosahedron shape if you look at the "corners" of each model and ignore the honeycomb patterns. The photo below shows yesterday's C320 in the background and today's C540 model in the foreground. The numbers refer to the number of carbon atoms in each Buckminsterfullerene. Settings: Printed on a MakerBot Replicator 2 with no supports except for the external support stand that prints along with the model. We printed this one at 120% scale to make it even bigger, but that made the stand thicker also, and therefore more difficult to remove. 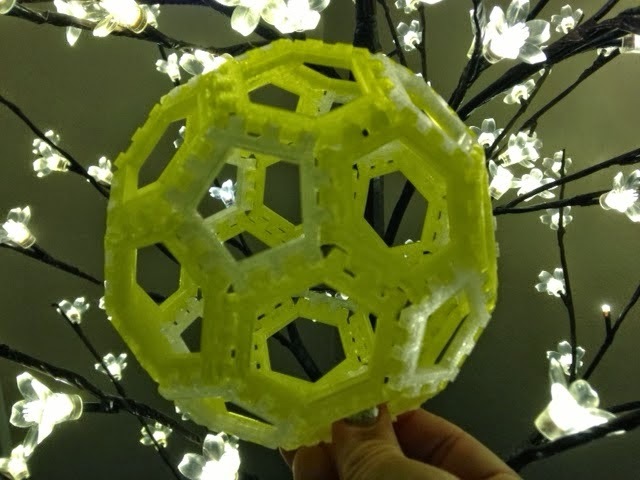 Next time I'll redo the scaling in OpenSCAD instead, so that I can scale up the Buckyball while making a new stand that preserves its fine grid. In general a Buckyball is just a convex polyhedron made up of regular pentagon and hexagon faces, with each vertex having three edges coming into it. A really cool fact is that every Buckyball has exactly 12 pentagon faces, just like the soccer ball; if you look at the pictures of C320 and C540 you can see that the corner cells of the icosahedral shapes of the models are tiny pentagons, while every other cell is a tiny hexagon. V - E + F = 2. F = P + H.
E = (5P + 6H)/2. V = (5P + 6H)/3. (5P+6H)/3 - (5P+6H)/2 + (P+H) = 2. Therefore every Buckyball has exactly 12 pentagon faces. In a way you can think of Buckyballs as expansions of the 12-pentagon-faced dodecahedron, with hexagons added between the pentagons to make an icosahedral shape with the 12 pentagons at the corners.